We present to your attention another new product — the cruise which combines all the best that can be encountered in a river cruise down the Volga River — «Excursion pearls of Volga cities»! This cruise will join «The Golden cruise collection-2016″ and it will take place on our new brand ship «Dmitry Furmanov»! «Golden Cruise Collection» – is the collection of the best Russian cruises from Infoflot Cruise Company with unusual itineraries and interesting excursions. Volga is the great river! Beginning with a tiny stream, taking about 150 000 tributaries among which about 200 small and big rivers, the Volga is gaining strength and power and turns into a mighty river. The Volga passes through the 15 subjects of the Russian Federation and finishes its way by flowing into the Caspian Sea. It is impossible not to admire with Volga’s power, width and grandeur! Beautiful, ancient and nice cities are like pearls on the blue string of the river. During the long stop in Gorodets for the tourists will be organized excursions at their choice: excursion to Saint Diveevo or to Semenov city “The Capital of golden khokhloma”. Next stop is in picturesque Plyos, the city of inspiration for many artists, and Kostroma with the museum of wooden architecture. Another interesting point along the route is stop in Yaroslavl. Tourists can get acquainted with the city whose historical center is listed as a world Heritage list of UNESCO. Long stop allows also to make an excursion to Rostov Velikiy (Rostov the Great), the oldest city of the Kievan Rus. The tourists will be able to rest from such an intensive program thanks to stop in the resort area «Yaroslavskoe seaside» here everyone can enjoy outdoor recreation. At the end of the trip, guests will arrive in the town of Myshkin, where you are prompted to choose from: city tour or a visit to the pristine village of Cascara – Martynovo, and then in the city of Tver. 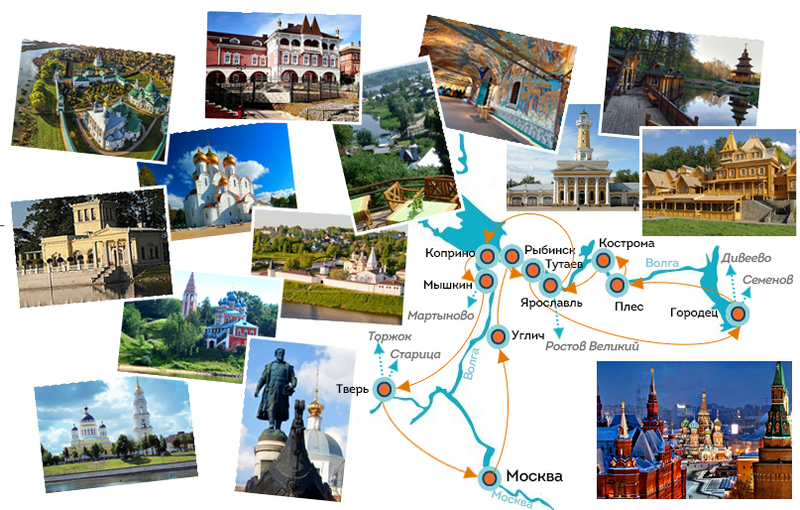 From Tver will be organized excursions in the ancient Russian city of Staritsa or Torzhok the city of gold embroidery and rich history.